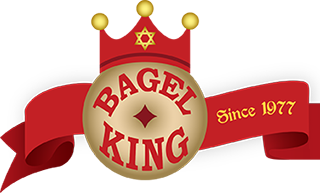 Home of the “kettle baked bagel” and voted #2 in top 10 Bagel restaurant in Florida!! *Add: Sliced Tomato, Bermuda Onions, Honey, Jam, or Cheese .50 each. Two eggs and cheese sandwich in a closed-face toasted bagel. Two eggs your way topped with American cheese, home fries, toasted buttered kettle baked bagel and coffee. No substitutions. Two slices of thick and fluffy egg bread (challah) French toast topped with cinnamon sugar, powdered sugar and maple syrup. A combination of two eggs your way with home fries, American cheese, layered and stacked with tomatoes, served with a toasted buttered bagel. Includes your choice of bagel with either fresh sliced salt belly lox or Nova (non-salty salmon). Includes romaine, tomatoes, sweet Bermuda onions, capers and cream cheese. All toppings served on side. Three extra large scrambled eggs cooked with sauteed onions and smoked salmon nova. Includes a toasted buttered bagel. One egg omelet sandwich stuffed with tomatoes, grilled onions, green peppers and American cheese on top with your choice of bagel. Three egg white omelet stuffed with spinach, mushrooms, onions and chicken (unprocessed all white meat) served with rip tomato slices. One egg your way" with a toasted buttered bagel." Crispy corned beef hash topped with American cheese, sunny side up eggs and a toasted buttered bagel. Two eggs your way with choice of four strips of thick cut grilled N.Y. style pastrami or turkey sausage or smoked applewood bacon and a toasted buttered bagel. Topped with cinnamon sugar and powdered sugar. Your choice of 2 or 3 extra large egg omelet stuffed with what you love! Decadent types of wonderful desserts from the pastry case. Ask your counter person for the dessert selection of day.